Please call or email us to receive your new personalized plan!! For most customers 70% of their heating expenses are incurred during December, January, and February. But paying for all these deliveries can be tough on the walllet. 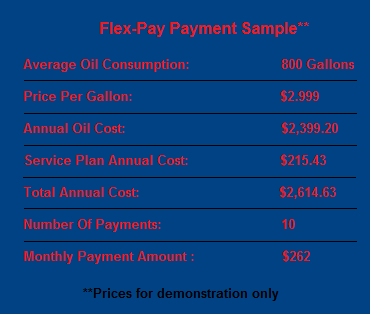 With Flex-Pay, customers spread their annual heating oil costs over the year and gain the freedom of knowing exactly what to expect. To calculate payments, Klebe Fuel estimates a customer's yearly oil consumption (based on previous consumption when possible) and adds in the cost of the annual service contract (if applicable). Then we divide that amount into eleven equal monthly payments.